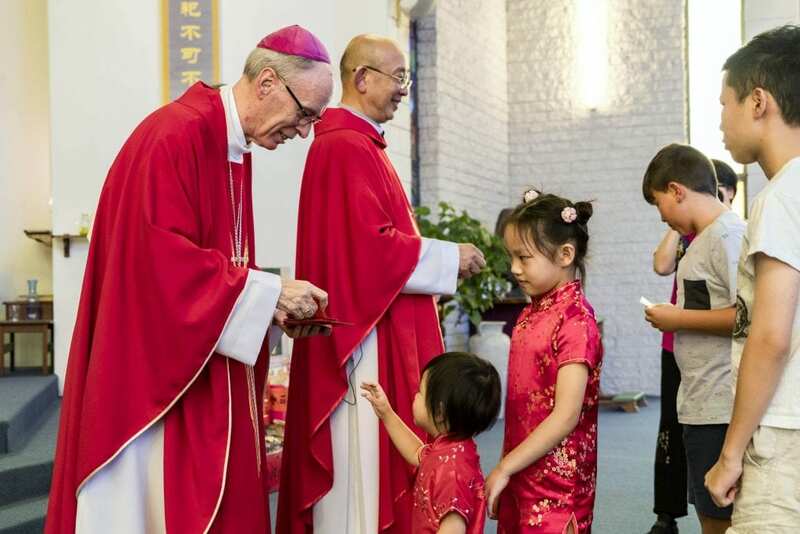 Bishop Donald Sproxton and Father Patrick Lim hand out “hong bao” red packets to the children of the congregation on 10 February 2019. Photo: Matthew Lau. 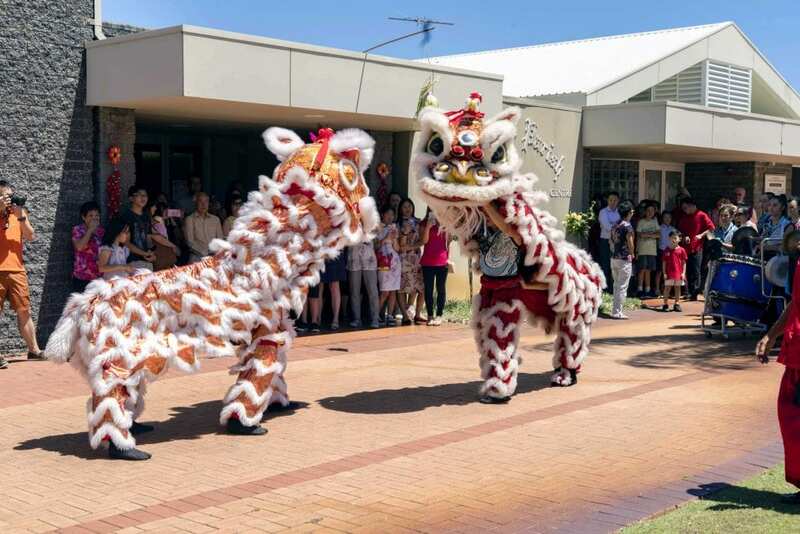 The Perth Chinese Catholic Community (PCCC) is hopeful that the Year of the Pig will bring forth blessings of good fortune and optimism. On Sunday 10 February, more than 250 faithful convened for the 11am Mandarin Mass at St Pius X Church, Manning Parish. Auxiliary Bishop Donald Sproxton was the main celebrant and was joined by Mgr Michael Keating, Mgr Tim Corcoran, Fr Greg Carroll, and PCCC chaplain Fr Patrick Lim. The pig is the 12th of the 12-year cycle of animals that appear in the Chinese zodiac, in relation to the Chinese lunar calendar. Last Sunday was the first time Chinese New Year had been celebrated at Manning Parish, as it was previously home to Como Parish for 25 years. 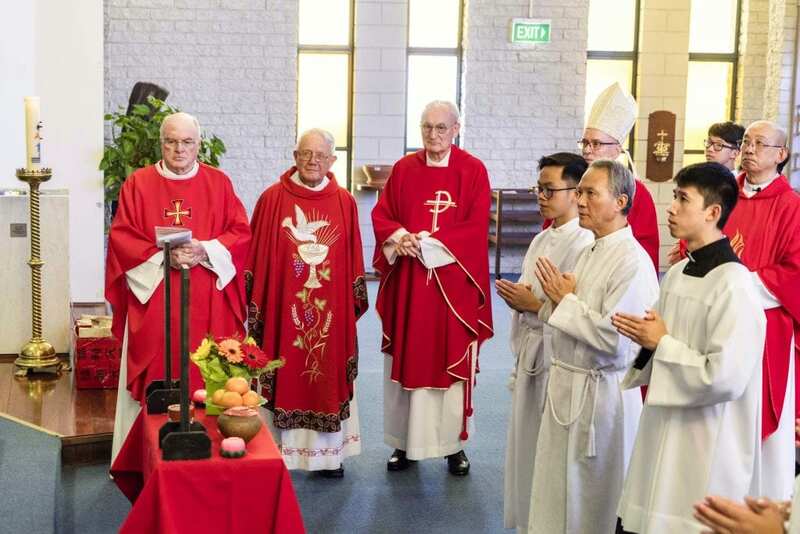 The concelebrating priests, bishop, and altar servers observe the Chinese ancestral ritual after the conclusion of Mass on Sunday 10 February. Photo: Matthew Lau. Bishop Sproxton used his homily to speak about how the Lunar New Year celebrations give people the chance to honour the bygone and distinguished traditions passed down from generations. “We acknowledge that this culture has received the Gospel of Jesus Christ, and as Jesus has been able to do for all cultures, the many good things of the Chinese culture have been highlighted and valued, and the cultural shadows have had a light shone on them and have been adapted. “Christ has the power to transform every culture and make it more life giving and honourable,” he stated. Each year, these cultural celebrations are enhanced, Bishop Sproxton said, because Catholics are inviting Jesus to continue to be part of our lives in the year ahead. The Chinese Community Centre Lion Dance Troupe WA entertained those present for CNY with a traditional lion dance outside St Pius X Church. Photo: Matthew Lau. The Year of the Pig, he added, is given for God’s people to shine. “The chubby face and large ears of the pig symbolise wealth. Let’s pray for the well-being of our families, both materially and spiritually. “Let us become fat through the blessings of our good God, especially wealthy in the gifts of faith and spiritual insight, so that we may come to know God better, learn to love God better, and seek to draw those around us to God by our living each day with faith,” Bishop Sproxton concluded. 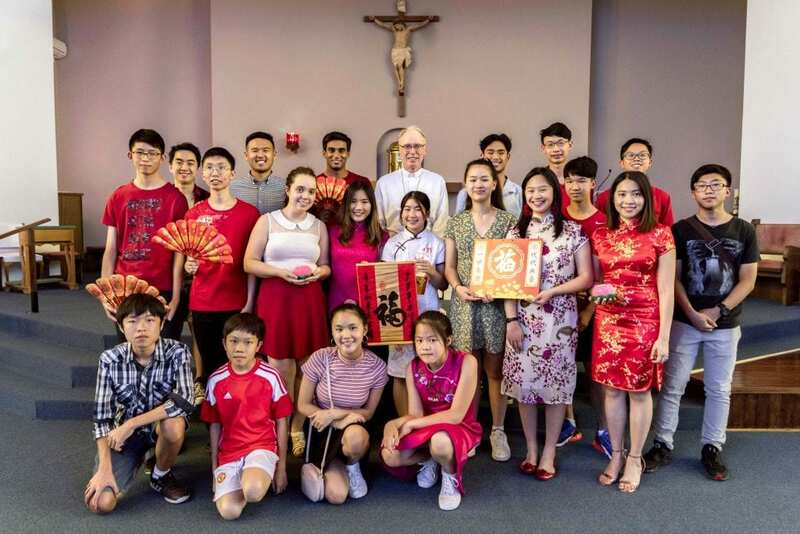 The Mass was followed by a Chinese ancestral ritual, passing of “hong bao” red packets to children, blessing of fruits, and a lion dance performance. Auxiliary Bishop Donald Sproxton pictured after Mass with members of the SPX Youth Manning group. Photo: Matthew Lau. Gregory Lo, PCCC liturgy coordinator, was delighted that the popular occasion garnered more than 250 attendees. “I think because we were in Manning Parish for the very first time, we had such a good turnout. As well, we are adapting ourselves to a new church,” Mr Lo said. The Pig’s character symbolises harmony, optimism, affection, trust, gentleness, goodwill and good wealth. “The Year of the Pig is not only for this Chinese community, it is celebrated by all Chinese around the world,” Mr Lo added.